It is almost five months since our baby Norman passed away, but the scar left by his loss seems fresh like it was yesterday. That day I knew from the morning when my wife called from Bujumbura that our baby was sick. I was many hours away at Nundu in the Congo, so I asked my wife to visit the nearby clinic for a checkup and report to me the result. I was on call that day at Deaconess Nundu Hospital; my wife did not tell me that our baby’s condition was serious. Of course it did not seem to be serious during the day. My wife said she did not want to disturb me while taking care of other babies and forsake them for my own child. I urged a colleague in Bujumbura to pass by my home and assess the baby and advise. But then I heard back from him about my baby passing away. The pain is still fresh and I cannot stop questioning myself. Maybe if I could have been there, the outcome would have been different. But I try to control my emotions and I pray God to help us master our inner selves. My wife Christine is also suffering. Only God can comfort. Our baby Norman seemed to be a special child to us because this was my wife’s fifth pregnancy. Our first born is a healthy girl. She is more than five years old now and goes to kindergarten school. She is a real blessing for us, but in between are stories of miscarriages and an anencephalic fetus. When the baby Norman was born he seemed to be such a new story, but again he passed away and it was a devastating. Our baby passed away after a severe malaria attack. 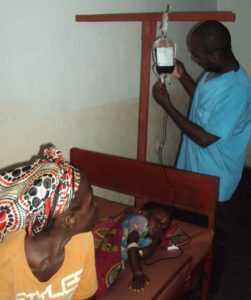 Malaria is a common condition that affects most babies in the pediatric ward at DNH, and, when associated with complications including severe anemia, remains the number one killer. In most cases, deaths occur when the family feels unable to cover medical fees and try to treat fever unsuccessfully with Tylenol and traditional herbs. As the course of malaria progresses with its associated complications, the babies are often brought to the hospital in desperate condition. This devastating illness which we have experienced in our own family can be prevented for many babies by earlier treatment. Thank you for contributing to the Deaconess Nundu Hospital Patient Care Fund. You are making a difference. Description of the Patient Care Fund : From this fund, patients’ families will be assisted when they are unable to cover hospital fees. Pediatric inpatient care, including treatment of malaria and infections such as pneumonia and gastroenteritis, is estimated to be $25-50/patient.